Gurgaon, September 13: Gaurika Bishnoi finally found the form she was searching for with five birdies in the second round of the 14th Leg of the Hero Women’s Pro Golf Tour on Thursday. Gaurika, who is still looking for her first win this season, shot 2-over 74 despite a bogey-bogey finish on the challenging Gary Player layout at the DLF Golf and Country Club. With rounds of 77 and 74, Gaurika is now 7-over 151 and leads her closest rival, young Khushi Khanijau (71) by two shots. Khushi, who has been showing a lot of promise and also finished second in the 11th Leg at Hyderabad in August, carded the first sub-par round of the week, as she compiled 1-under 71 which also included five birdies. Afshan Fatima, winner last week in the 13th Leg of the Hero WPG Tour at Greater Noida, shot 76 and at 154, she was third and one ahead of Neha Tripathi, who after a disappointing first round of 82 made a nine-shot improvement with a 73. At 155 she is fourth. Gaurika birdied third and ninth but dropped shots on second, sixth and eighth to turn in 1-over 37. On the back nine she birdied three times between 12th and 15th, but also dropped shots on 11th, 13th, 17th and 18th for a total of 74. Khushi had a fine front nine with two birdies against one bogey, while on the back nine she had three birdies on 11th, 16th and 18th. However, three bogeys in a row from 13th to 15th spoilt her fine card. Amateur Sifat Sagoo, who is playing on her home course, added 79 to her first round 80 and is Tied-5th alongside first round co-leader, Millie Saroha (82). 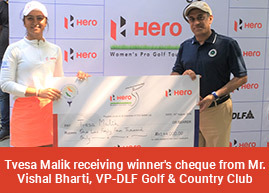 The surprise was Amandeep Drall, who for the second day running shot 80 and was placed seventh, while Hero OOM leader Tvesa Malik (79-82) disappointed as she was Tied-8th alongside Gursimar Badwal (84-77) and Anisha Padukone (86-75). In the final round, Sonam Chugh, Astha Madan and amateur Rhea Saravanan will tee off first, while Tvesa Malik, Siddhi Kapoor and Mehar Atwal will follow them. The third group has Amandeep Drall, Anisha Padukone and Gursimar Badwal. The penultimate group will see Neha Tripathi, amateur Sifat Sagoo and Millie Saroha, while Gaurika Bishnoi, Khushi Khanijau and Afshan Fatima will tee off last in the leader group.